In the atmosphere of quiet, remote seclusion at Kagyu Thekchen Ling, monks aspiring to become Acharyas in higher Buddhist philosophy engage intensively in prayers, studies, and debate. Those in the 3-year retreat centre, Ngedon Chagchen Ling, practice the ancient contemplative tradition of the Shangpa Kagyu lineage. 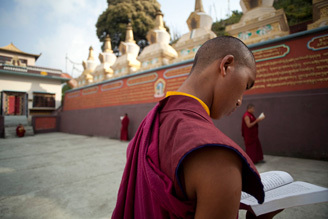 Accepting the offer of a 4-acre site by the local Buddhist community, the Third Jamgon Kongtrul Rinpoche bestowed the empowerment of Chenrezig to more than 4,000 devotees on the 15th day of the 1st Tibetan month of the Fire Hare year, 1987, and agreed to the community’s request to establish a monastery there to support and preserve the religious tradition and culture of the people. Work started in April 1988 and Kagyu Thekchen Ling opened on June 6th, 1990, the great auspicious day of Cho Khor Du Chen, the day the Buddha first turned the Wheel of Dharma. A year later, on March 10th, 1991, the first 3-year Shangpa Kagyu retreat commenced under The Very Venerable Bokar Rinpoche who guided the successive retreats until his parinirvana in 2004. 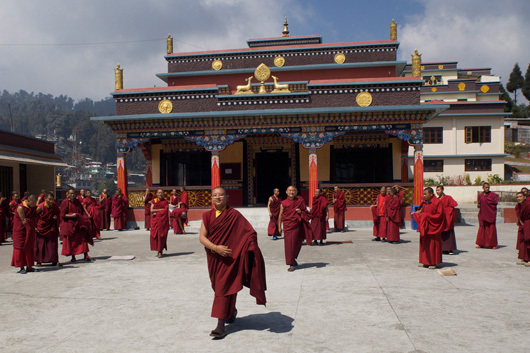 In 2001, during His memorable and historic four-days visit to Kagyu Thekchen Ling, His Holiness the Dalai Lama opened the Mani Lhakhang, a community Temple open to lay devotees. 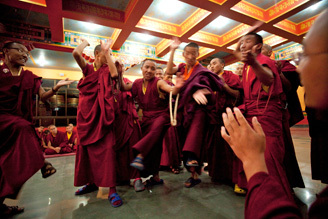 Today, 2012, among the 130 monks at Kagyu Thekchen Ling, 110 are pursuing the 13-year Acharya program at its centre for higher Buddhist philosophy, the Rigpe Dorje Institute. Among them is His Eminence the Fourth Jamgon Kongtrul Rinpoche. The principal of the Institute, The Venerable Drupon Khenpo Lodro Namgyal, is also personal tutor of philosophy to His Eminence.